Zoocracy is akin to democracy, in that decisions are made by vote of an enfranchised population. But democracy—in theory, in practice, and in etymology (the Greek demos means “common people,” i.e., humans)—pertains to an enfranchised population that is limited to humans, whereas zoocracy extends the franchise to all species. Zoocracy was initially conceived by and intended for the internal governance of the Humane Party in 2010-11. The initial design was tailored to mirror certain aspects of the U.S. system of government—the HP being a political party serving the U.S.—but parties and governments in other countries are heartily encouraged to adapt and implement zoocracy to fit their own jurisdictions. This tentative structure laid the groundwork for achieving several goals: integration with the existing U.S. system of representation—a political necessity for a U.S.-serving party; protection of political minorities in a much more powerful way than prior systems provide—a significant advance in the area of civil rights; and representation of other animals—essentially unprecedented. Designing this system presented—and, since the task has not been completed, still presents—significant challenges. These challenges include, first, how to allocate the individual “seats” of classes B and C, i.e., which individual constituencies are to be expressly represented by a seat in this class; and, second, what social-political-legal theories and procedural vehicles to use in empowering the seats of class C.
Extension of the legal concept of guardian ad litem has emerged as a promising possibility in enabling at least part of the solution. The concept of proxy voting may also play a part, such that human guardians ad litem, once assigned, would effectively serve as proxy voters for the votes held by the animals who are their wards. A major developmental breakthrough came in 2016 with completion of the Abolition Amendment. Through this document, an articulate but flexible definition of animal—honed through years of refinement by the Humane Party and almost a year of public commentary—became available, and a model for the application of the guardian ad litem vehicle to members of other species was made explicit and clear. This foundation enabled the HP Policy Team to resume, in 2017, the development of a U.S.-based zoocratic (zō-ə-kræt′ɪk; zoe-uh-KRAT-ik) system. All 132 seats will be filled by individuals who have committed, through the Humane Party Oath, to veganism at the personal level and abolitionism at the political level. These individuals will make decisions as a body by majority—or perhaps, on certain matters, super-majority—vote, with one vote per representative, just as in the U.S. Senate or House or other legislative bodies. The process of developing the first zoocratic system of government has been slow, and—just as with anthropocentric political theories and governmental systems—zoocracy will undoubtedly be perpetually subject to revision and improvement. However, establishing and implementing an inaugural zoocratic system will at least provide a basic foundation upon which to build. Effective implementation will demonstrate—again, by example—that what once would have seemed outrageous and ridiculous is not only possible and practicable but in actual, working practice. Most importantly, by virtue of its encompassing a much broader pool of constituents and concerns than any prior representative body, a zoocratic body will be able to identify, consider, and address issues at an unprecedented level of potency. And given the environmental, ethical, and economic problems that our world now faces, such unprecedented potency can hardly arrive soon enough. Toward that end, individuals who would like to serve as a representative in the Humane National Committee are encouraged to submit the HP volunteer application form. Thinkers interested in helping further develop zoocratic theory—to write the vegan, abolitionist, zoocratic equivalent of The Federalist Papers—are also encouraged to apply. As Susan B. Anthony, Emily Pankhurst, and other leaders of and participants in the movement to gain women the vote knew, one’s rights and liberties are never secure without permanent voting power. And that goes for all—meaning all—sentient beings. Online Etymology Dictionary, entries for “zoo-” and “-cracy”. Seemingly any time that animal sentience and its political-legal ramifications are taken seriously and acted upon, mockery ensues. The HNC design and the notion of zoocracy itself may—and probably will—be initially ridiculed, as have been many other Humane Party undertakings. Charles Dickens’ view of such ridicule is worth bearing in mind: “Some people laugh… but [a changed person] lets them laugh, for he knows that nothing ever happened on this globe, for good, at which some people did not have their fill of laughter in the outset” (“A Christmas Carol (Dickens) | Fantasy Literature for Activists #3” [Humane Herald, 2017, quoting A Christmas Carol, Charles Dickens, 1843]). Ratification of the Abolition Amendment will grant legal standing and personhood to—i.e., emancipate—other animals in all U.S. jurisdictions. But the HP need not wait for this emancipation event to occur before putting emancipation into practice internally. On the contrary, the HP can “be the change” by actually granting other animals permanent political power within the HP and recognizing them as full, literal constituents—as persons who hold inalienable rights—thereby putting theory into political practice and making animal personhood not just an aspiration but a political fact, at least in the HP. The zoocracy model described in the present article is, therefore, a way for the HP to lead by example, giving the world its first demonstration that a political system in which other species are recognized as legal persons can work and thrive. Such leadership by example—being the change—is an integral part of what distinguishes the HP from other political parties; both the current HP platform and goals statement refer to this organizational trait. The strictly geography-based approach that pervades virtually all prior political systems, including the U.S. system, is inherently problematic in terms of providing adequate representation for political minorities. For example, a given minority could comprise 10% of the general population but still not be in the majority in any given geography-based constituency. In such a case, that minority—numerically large, taken as whole, but thinly spread—could easily fail to elect even one out of, say, 435 representatives. Class B of the present model is designed at least to partly offset this problem. Allocation of seats for Class B is itself a politically charged matter; every decision might be decried as “unfair” by someone and offered as evidence that the HP “discriminates” against someone. Nonetheless, the difficulty of a task should not be used to justify avoidance of the task. Allocation of seats for Class C might also generate disagreement, particularly as scientific understanding of other animals—their bodies, their psychological makeup, their behaviors, and their habitats—develops. For such reasons, this particular embodiment of zoocracy as well as zoocratic theory in general will likely require significant elaboration and revision over time. Theory will prove to be crucial in bringing to pass the political victories necessary to achieve legal personhood and political representation for other animals. A good precedent—and a “preview” of the path to animal emancipation and zoocracy—can be found in the role that thinkers leading up to and including the Enlightenment era—John Locke et al.—served in laying the foundation for the American Revolution: the U.S. Constitution, Bill of Rights, and Declaration of Independence are perhaps the supreme practical embodiments of Enlightenment theory. When theory surrounding personhood—and “peoplehood,” to be discussed in a separate article—for other animals has sufficiently coalesced and been presented to the world in a compelling form, a similar revolution will result naturally and rapidly. Such compelling form may appear as a vegan, abolitionist, zoocratic equivalent of The Federalist Papers (Alexander Hamilton, James Madison, and John Jay, 1787-88). A guardian is a person who has the legal authority and duty to care for another (the ward), especially because of the ward’s incompetency—e.g., infancy, mental incapacity, or disability (Black’s Law Dictionary, West, 2001). A guardian ad litem is appointed by a court to represent an incompetent in a particular legal matter. Id. Currently, in the case of humans, incapacitated individuals can and do routinely assert their rights through a permanent guardian (such as a parent) or, in the absence of such a guardian, a guardian ad litem; again here, the ultimate holder of the rights being asserted is the ward, not the guardian, of course. Once the Abolition Amendment has become law, animals of other species will also hold rights, and their rights will need to be asserted through a guardian, since they will be incompetent to represent themselves in legal matters. Internally, however, the HP need not wait for the Abolition Amendment to be passed and ratified into law. 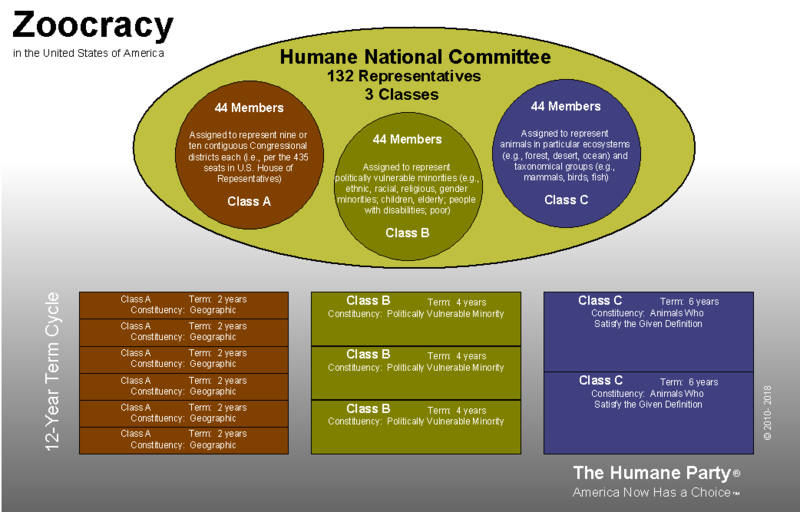 Through the Humane National Committee (HNC), the HP can and will begin treating animals of other species as persons, rightsholders, and literal constituents with full voting power. That voting power will be wielded, within the HNC, by a guardian appointed or selected by the HP through a process that is still in development. Note that no competent parent will be available to serve as a guardian, of course, since a crocodile’s parent will also be a crocodile. Thus, the guardian ad litem approach will be necessary. Note also that the HP’s selection of a “guardian ad litem” for purposes of HNC representation will not have any legal effect, i.e., it will not be binding outside of the HP. However, by calling this representative a guardian ad litem, the HP will, by design, evoke a highly developed body of law and ethical rules pertaining to guardians, thus avoiding having to remake these principles out of whole cloth and making clear the rights-holding, legal personhood, and literal constituency of other animals in the HP. A proxy is one who is authorized to act as a substitute for another, especially, in corporate law, one who is authorized to vote another’s shares of stock in a corporation. Id. Shareholders of a corporation can and do routinely vote their shares through a proxy; the shareholder remains the owner of the shares and ultimate holder of the power they represent, of course; the proxy serves merely as an instrument through which that power is wielded. Clearly, enfranchisement of individual persons in society as a whole or within a political party intended to serve society as a whole differs from shareholding in a corporation. The guardian ad litem analogy is, therefore, closest, in the present author’s view, because, unlike shareholders, other animals are not able to choose their proxies. Thus, other animals are more like traditional wards than shareholders—and, indeed, are to be treated literally as wards, upon emancipation, when their rights need to be asserted. However, more people in our culture may be familiar with publicly traded corporate shares—which are often voted through proxy—than with the specifics of the guardian ad litem mechanism. Thus, the shareholder-proxy analogy tends to be helpful in explaining zoocracy. Section 4 of the Abolition Amendment expressly provides for future refinement of the definition of animal, while also establishing limits, such that “in no event shall this definition exclude any organism with an observable capacity to fear, grieve, or experience pain. An organism’s possession of a central nervous system shall be sufficient, but not necessary, proof of such capacity” (The Abolition Amendment, Humane Party, 2016). This ratio is aimed at keeping the size of the HNC to a manageable number of seats. The HNC’s primary policy focus will be on national and international issues, leaving state and local policy primarily to state chapters. But, as with other parts of the HNC design, if more granularity is needed than 44 geography-based seats can provide, this ratio can be amended. Anthropocentrism denotes the view, theory, or system of belief or value in which humans are regarded as the “center of the world” or in which “the world revolves around humans.” In focusing exclusively or almost exclusively on human concerns, anthropocentrism—a form of otherism—is inherently hierarchical by effect of focus on that which is regarded as central rather than peripheral, a circle-plus-hierarchy effect that can be envisioned as a cone, with humans at the apex and all else beneath (“Vegan Literary Theory and Criticism: Toward a ‘Literature of Their Own’,” Humane Herald, 2017). Prior to the introduction of zoocracy, all systems of government, to the present author’s knowledge, were exclusively anthropocentric. “The right of voting for representatives is the primary right by which other rights are protected” (Susan B. Anthony, “On Women’s Right to Vote,” 1873, quoting Thomas Paine, Dissertation on First Principles of Government, 1795).